Lacrosse is a challenging sport that requires a combination of skills. In fact, the sport features elements from baseball, hockey, soccer and football. When young players begin lacrosse, they can improve their natural talents by strengthening their bodies and improving their speed and power. Of course, having the right equipment is definitely a must. Lacrosse gear includes a stick with a net and a ball. Lacrosse players should focus on their footwear as they need traction to play effectively. Players should purchase cleats, which are shoes with leather, plastic or rubber spikes attached to the sole. When playing with cleats, team members will gain traction by digging the spikes into the grass. Picking strong, sturdy lacrosse shafts from LacrosseMonkey is important as well. During game play, one team member will throw the ball to his or her teammate who must catch it in the net of their lacrosse stick. Players score points by getting the ball past the other team’s goalie. In order to excel at lacrosse, players must have the strength to explode with power at the right time. Therefore, strong leg muscles are a necessity. Players can practice standing step jumps by squatting and then jumping up onto an elevated surface such as a wooden block or a step. Lacrosse players should repeat the exercise 10 to 15 times. Another area of strength for players to focus on is the forearms as handling the lacrosse stick with dexterity will help players win their games. Lacrosse team members should practice their wrist action, which will help them handle the stick. Pushups and chin-ups are good ways to develop the wrists and forearms. Lacrosse is an intense contact sport that forces players to run while balancing a ball in a net at the end of a stick as competing players attempt to take the ball. In order to prevent themselves from losing the ball, players should focus on building endurance by running sprints. When players build their staying power through wind sprints, they’ll remain strong and fast until the end of the game. 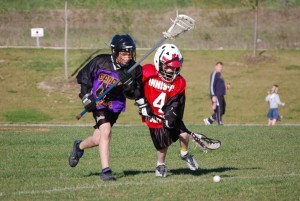 Young lacrosse players are often weak shooters due to using the incorrect stances in different situations. When players are shooting the ball, they should set their right foot behind the left, which will permit the front shoulder to close with the player’s back toward the shot. With the right foot planted firmly, the player can increase the power and aim of each shot. With extra training and a lot of determination, a young team member can become the best player on the field.